If you spot Thomcord grapes in your local market do not doubt; throw them in your cart and proceed to the checkout stand immediately. Consider making jam with them and you will have just made a superior decision and one you should not doubt. Note: The ingredients for this recipe are weighted measurements with a food scale. Combine the stemmed grapes, sugar, and lemon juice in a large saucepan and bring to a boil over medium high heat. Let the jam boil and I do mean boil, it may look violent but do not doubt this is what you want your jam to do. Let it boil in this same manner for 10 minutes. After 10 minutes the skins should be popping off the grapes, skim some of the skins off the surface with a slotted spoon if you have a problem with them in your jam. I have to admit I had doubts about not skinning the grapes, but trust me it all worked out in the end. I left some of the skins in the pot and they did break down while cooking. Mash the grapes on the side of the pot with a spoon or a potato masher. Add the powdered pectin and stir from the bottom every few minutes for 10-15 minutes until the mixture is reduced by half and the jam is starting to look shiny. If you feel any sticking to the bottom of the pot, turn your heat down a bit. If your jam looks like this do not doubt, you've gotten it right. If you don't like any cloudiness to your canned jam, skim that little bit of white jam scum off the surface. It won't hurt the flavor of the jam it's more of a looks thing. The best long term storage method in my opinion is boiling water canning, but with a small batch size such as this you could easily store it in the freezer in freezer safe containers. I just doubt I could wait for it to defrost when I want some jam for my toast in the morning. Besides I reserve my precious freezer space for ice cream storage. 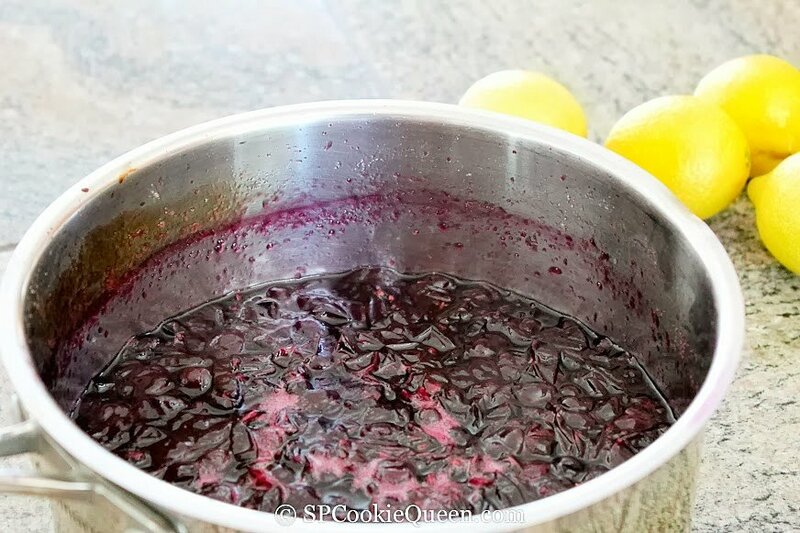 Make sure and can your jam right off the stove while it's still boiling hot. Make sure and place it into sterilized jars, make sure and use new lids and wipe the tops of your jars to ensure a proper seal. 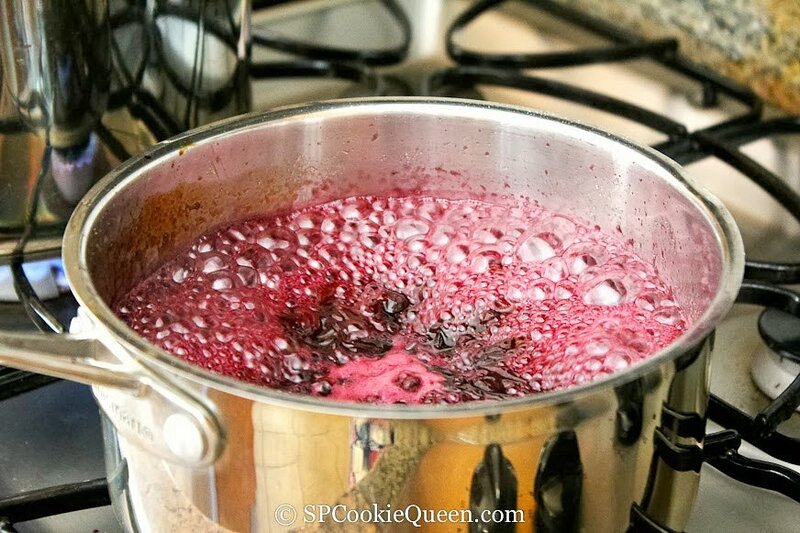 Make sure and process your jam in the boiling water for 10 minutes. That should hopefully erase most doubts you have about the safety of using your jam in the future. The jam will keep in a cool dark place unopened for up to one year. If you open it and see any signs of spoilage refer to the old saying, "When in doubt, throw it out!" Yield (3) 8-ounce jars and (1) 4-ounce jar. Here is a link for more processing instructions if you want a visual. Never doubt that crepes and Thomcord Grape Jam are a reason to have breakfast for dinner. I doubted this scruffy table I dragged home from a resale shop would ever get re-finished and make it into my home. I doubted I would ever get the layers and layers of old paint off it, I doubted I had the strength to make it happen. I doubted I would ever be able to decide on a color for it after painting it four different ones. I doubted I would ever be able to clear out the shoes and clutter of items without a home that occupied the space I wanted the table to go. I doubted after the last year and a half that things would ever start to fall into place. While I still have my doubts, with each small hurdle I make it over I start to realize I'm much tougher than I ever thought and I just have to remind myself to quit doubting that. I should never doubt my little photo bomber wants to be included in every photo. I want to add more for you but its Monday and I'm tired, remember I just had a birthday and now I'm officially an old lady. Sigh. "While I still have my doubts, with each small hurdle I make it over I start to realize I'm much tougher than I ever thought and I just have to remind myself to quit doubting that." THAT'S RIGHT! Tho' I also really loved the part about not doubting your little photobomber. You've made me want breakfast for dinner! Katty darling, isn't that the truth. Why not breakfast for lunch too! Oh I definitely want breakfast for dinner after seeing your jam! 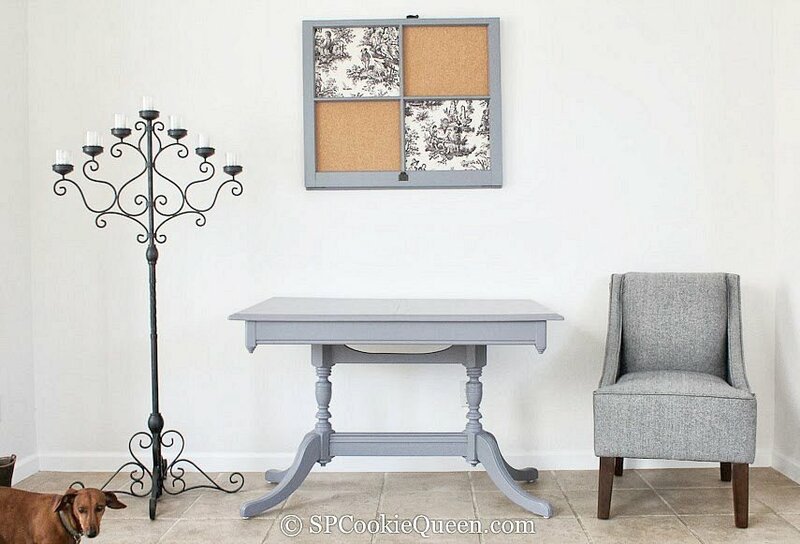 Love that table too, fab color choice! I love fig jam and blackberry jam! I'm going to love this jam when I find the grapes. :-) Your photo bomber is adorable. Seriously... do your talents never end?? Love, love this jam, but that table is awesome!! I would have no idea where to begin to make it look pretty again. Well done! Love the little photo bomber! 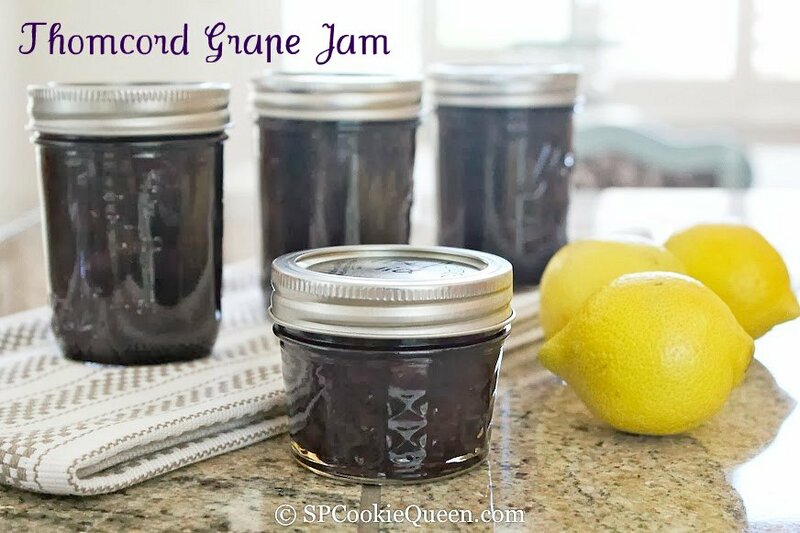 Wow, grape jam...I never thought in making jam with grapes, since it is so easy and simple, I will sure keep my eye open for Thomcord grapes. Gina - this jam looks easy to make and completely reminds me of being a kid. I can just taste it now. Loving the new additions to your room! Thank you for the shout out on my Balsamic Fig Jam. I am actually up to 72 half pint jars that I have made this year. Not sure if I am going to crank out one more big batch before the fig season ends. Hope your week is going well! That is awesome Lisa. I'm going to try and make a small batch before summer is over. Your recipe is so good and those are lucky folks who are getting it. Happy Birthday Gina!!!! We have to lunch to celebrate your birth!!!! 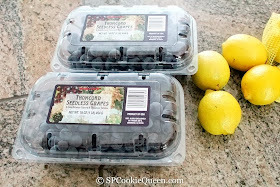 I have never seen these grapes in the market ;( So, will you please bring me a jar of jam at your lunch !!?? You did an incredible job on the table and I just love the color! I haven't made crepes in years but seeing your photos makes me want to whip up a batch and serve with your homemade jam that I still have in my pantry. Perfect treat for anytime of day! I don't know how I missed this post, sorry! Your Thomcord Grape jam looks wonderful. I've never seent these types of grapes before. You are the Jam Fairy, besides now being the DIY Queen. You never cease to amaze me with all of your talents. Your table is stunning. Love that beautiful table and the colour is just gorgeous. 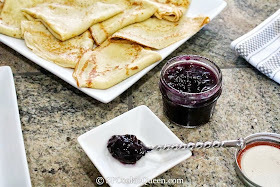 Crepes and homemade grape jam...what a treat! I'm loving this, Gina! I'm with you on that one....your jam is the reason to have breakfast for dinner or dinner for breakfast...whichever...both! Great job on the table!. Cute dog's face!